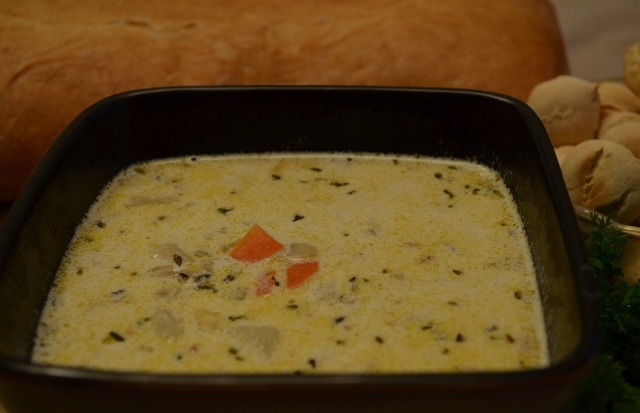 Canned clams make this New England style creamy chowder recipe quick to prepare. 1. In a large saucepan, cook bacon over medium heat until crisp. Add onion, celery, and carrots; reduce heat to medium-low. Cook, uncovered, for 10 minutes, stirring frequently. 2. Add potatoes, clam juice, water, dried thyme (if using), pepper and bay leaf. Bring to boiling; reduce heat. Simmer, covered, about 10 minutes or until potatoes are tender. Remove and discard bay leaf. 3. Stir in fresh thyme (if using), clams, cream and corn; heat through.